“bury a friend” is the title of one of the many singles recorded by American singer-songwriter Billie Eilish. The song’s lyrics find Eilish asking someone or something a series of profound questions. It’s not made exactly clear who this person or entity is. While it isn’t clear who or what some of these questions are posed to, it is 100% clear these are important questions to Eilish. But is Billie Eilish singing about death? Some have answered the above question in the affirmative. They feel when Eilish asks the question of where we go to when we fall asleep, she’s basically asking where go when we die. But what do we really think? Is Eilish really referencing the death and the afterlife in these lyrics? Well, it’s really not clear. However, there are two possible answers. Firstly, she could just be using the lyrics in their literal sense. If this is the case, she’s just asking where we go when we lay on our beds to sleep. Secondly, she could be using “sleep” in its figurative sense. This would mean “sleep” refers to death. And many feel Eilish might not be using “sleep” literally. And do we agree with those that say Eilish is asking where we go when we die? The lyrics and theme of the song are dark and eerie enough to make us suspect death is what she’s referring to with the word “sleep”. This is the official music video for Eilish’s “bury a friend”. Barely 11 hours after this video was published on YouTube, it received over 11 million views. Such an incredible feat! 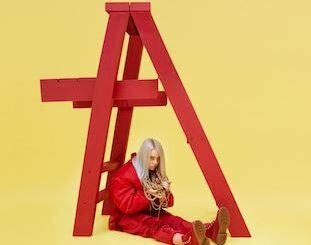 “Bury a Friend” is a track in which the subject of the song revolves back to Billie Eilish herself. In other words, the lyrics are sung from the perspective of another entity, specifically “the monster under” Billie’s bed. However, she goes on to state that this fearsome beast is indeed herself. In other words, she is singing to herself using the character of this monster as an external yet most-intimate voice. The monster questions the nature of its relationship with Billie. For instance, it wonders why Billie isn’t afraid of it. In fact it goes on to state that Eilish actually cares for it. However, most of its thoughts seem to be based around negativity. It appears that this creature has put itself in an undesirable position that it cannot escape from. Indeed, its thoughts have become so disturbing that at times it considers self-harm. The inclination for this monster to harm itself is found in the post-chorus, where the singer repeatedly utters, “I wanna end me.” Since Eilish has stated that this fictional creature and she are actually one in the same, these lyrics apparently express a desire for Billie to terminate her own life. As such, the “friend” Eilish refers to in the title of the track, the close companion of the monster that it is addressing, is herself. In other words, Eilish sometimes has the desire to bury herself, as in commit suicide, with such a mindframe resulting in her being her “own worst enemy”. Just like virtually all Eilish’s songs, Eilish co-wrote this single with songwriter and producer Finneas O’Connell. Eilish is related to O’Connell. Actually she’s his younger sister. O’Connell, who is also a noted music producer, produced this song. Eilish and her management released this single on January 30, 2019. It is the third single from her album of the same name (When We All Fall Asleep, Where Do We Go?). The song “You Should See Me in a Crown” was the first single to be released from the aforementioned album. “When the Party’s Over” came out few weeks later as the album’s second single. This was Eilish’s second song to be released in 2019. Her first for 2019 was a song titled “When I Was Older“. The super creepy music video of “bury a friend” was directed by American film director and writer Michael Chaves. Did Billie Eilish tease this song before its release? Yes. On January 28, 2019, she uploaded a few seconds of a video clip of the track on her official Instagram page. A day after that, she announced the release date of the song as well as the title of her debut album. Who sings the additional vocals on “bury a friend”? Those creepy vocals you hear alongside Eilish’s are from a British rapper/singer named Crooks. Having said that, it’s noteworthy to point out that Crooks isn’t officially featured on the track. Tags: Billie Eilishbury a friendCrooksFinneas O'ConnellMichael ChavesWhen We All Go To Sleep Where Do We Go? You forgot careful. It goes: billie, come here, listen, careful. Crooks is NOT an American singer, but a British rapper. Thanks for drawing our attention to this, Dave. We have made the necessary correction. This song has illuminati written all over it, i believe she is a witch and the song is about a friend that heard or seen something they werent supposed to and now she feels bad because they are gonna have to die. When Billie says ,”When we all fall asleep, where do we go?” she is talking about dreaming. 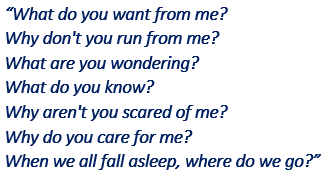 Another part of the song goes like ,”When my limbs are frozen and my eyes wont close,” she means sleep paralasis, which is something that Billie also struggles with. During her life she has dealt with a lot of nightmares and has had sleep paralasis five times. She also had a lot of reoccurring dreams. She is singing from the perspective of a monster under her bed. In times, she is her own monster.